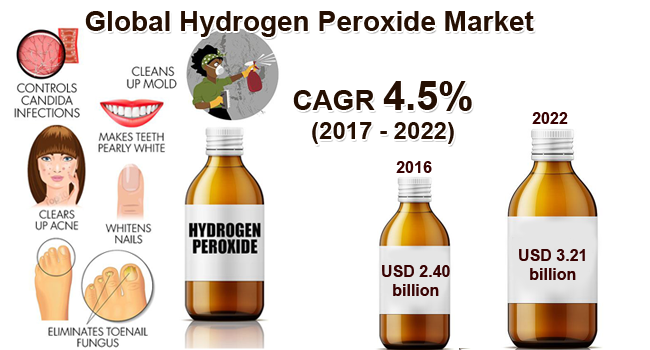 With the presence of a large pool of participants, the global hydrogen peroxide market is displaying a highly competitive business landscape, finds a new research report by Zion Market Research (ZMR). Arkema S.A., Mitsubishi Gas Chemical Company, Kingboard Chemical Holdings Ltd., and Aditya Birla Chemicals Limited are some of the key vendors of hydrogen peroxide across the world. These players across hydrogen peroxide market are focusing aggressively on innovation, as well as on including advanced technologies in their existing products. Over the coming years, they are also expected to take up partnerships and mergers and acquisitions as their key strategy for business development, states the market study. In a major breakthrough witnessed across hydrogen peroxide market, in August 2018, researchers at MIT have created an innovative hydrogen peroxide sensing molecule that will help them see the interior parts of the cancer cells and then determine the effective drug therapy to combat cancer. As estimated in this report, the global hydrogen peroxide market was evaluated at US$ 3.81 billion in 2015. Witnessing a tremendous rise during the period from 2015 to 2021, the revenue in the hydrogen peroxide market is slated to reach US$ 5.19 billion by the end of the forecast period. “Massive product penetration across paper & pulp, textiles, mining, pharmaceutical, medical, and personal care sectors is anticipated to expand the scope of hydrogen peroxide market over the coming years,” says the author of this study. Apart from this, extensive use of the product as a bleacher, cleaning agent, oxidizer, and sanitizer in myriad industries will substantially contribute towards the hydrogen peroxide market revenue in the years ahead. Furthermore, large-scale application of hydrogen peroxide in food packaging, furnishing, food packaging, and water treatment will further impel the hydrogen peroxide market space. Oscillations in the costs of raw materials, however, are likely to impede the expansion of hydrogen peroxide market over the years to come. Nevertheless, the widespread product use in the developing countries, including China, Brazil, and India will generate lucrative opportunities for the business over a couple of years, normalizing the impact of hindrances on the hydrogen peroxide market, reports the study. Regionally, Asia Pacific has been leading the worldwide hydrogen peroxide market and is anticipated to continue on the dominant position in the years to come, states the market study. For the record, Asia Pacific contributed nearly 50% towards overall hydrogen peroxide market size in 2015. Rise in the paper & pulp production across the densely populated regions such as China and India is anticipated to favorably impact the hydrogen peroxide market in APAC over the next few years. The high number of market players being headquartered in North America is another significant factor that is supporting this regional market. The growing requirement of hydrogen peroxide in packaging materials and recycled paper will leverage the hydrogen peroxide market profitability over the years to come.